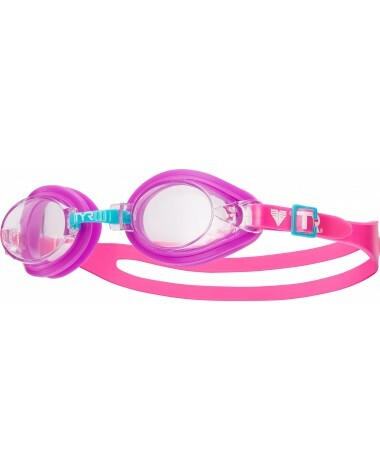 Start your child's swim adventure off right with TYR Qualifier Kids' Goggles. Constructed with soft silicone gaskets and a split silicone head strap, the LGQUAL is ideal for young athletes. Showcasing easy-adjust side clips and an adjustable nosepiece, Qualifier Goggles allow for customizable fitting and comfort on the face. Plus, every pair includes polycarbonate lenses with anti-fog and UVA/UVB protection. All TYR kids' goggles have been tested and approved in accordance with the Consumer Product Safety Commission's guidelines. Channel and ridge system that allows three changeable sizes. Seen on Training and Kids goggles. The split strap is a side-adjusted single strap. When wrapping around the back of the head, the strap splits into two so as to create an effective triangulation of tension between the strap and the goggle around an athletes head. These straps are used on Training, Kids and Recreation goggles. Use "kids" goggles for small head! Qualifer goggles are too small for teens. I erroneously ordered the "Qualifier" goggles for my 12 and 14 year old. They were too small. 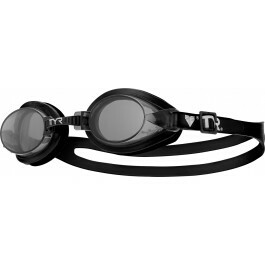 If you are looking for affordable goggles for your teen, go with the "Team Sprint" goggles. My kids love those. They fit great and last long.